Successfully Added Intelligent 27-Inch Commercial Sign - Android OS, Audio Out, iOS + Android App to your Shopping Cart. 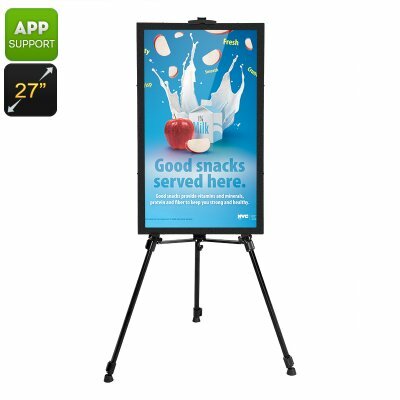 Grab the attention of all passerby’s and inform them about your shop’s latest offers and discounts with this 27 Inch FHD display board. Offering the perfect solution for restaurants, shops, bars, and shopping centers this magnificent electronic display is guaranteed to raise the awareness of the presence of your business among the passing crowds. Display your company’s offers or restaurant menu’s in stunning 1080p resolution and see the amount of visitors grow instantly – having such an inviting digital display board at your doorstep is guaranteed to leave a positive and welcoming impression. Design your own marketing materials and instantly portray them on a beautiful 27 Inch display. With this commercial display board you will be able to share your company’s message in a way that will surely sets you apart from your competitors. Featuring a 3.5mm Audio jack you can even hook it up to a pair of speakers, allowing you to create a full audio-visual effect. Running on an android Operating System this display board can be easily paired to your smartphone and controlled from a distance. Via its built-in internet function you will be able to control your digital display from a distance to ensure that, no matter where you are, you can be sure that your latest offers will be shown to the passing by crowds. Additionally, its Clever Canvas Application allows you to create eye-catching messages and designs that can be displayed instantly onto your electric marketing board for the world to see. It even allows you to schedule messages, greetings, and promotions well in advance through which it provides you with a wide range of marketing options. Significantly increase your firm’s awareness among passerby crowds – with this electronic commercial sign expensive and time-consuming trips to the printers to print your marketing materials are an issue of the past. This magnificent sign takes your company into the 21st century and lets the number of visits to your shop or restaurant skyrocket in no time. This intelligent 27-inch commercial sign comes with a 12 months warranty, brought to you by the leader in electronic signage as well as wholesale electronic gadgets..